The Third Health Ministers’ Forum, held in Banja Luka, Bosnia and Herzegovina on 13–14 October 2011, ended in the signing of the Banja Luka Pledge. Unique in the WHO European Region, the Pledge sets a five-year course towards including health in all policies and working across sectors to address the social and economic determinants of health and reduce noncommuniable diseases. to strengthen public health capacities and services for control and prevention of noncommunicable diseases. In particular, they pledged to work towards the goal of including health in all policies: for health and health equity to be considered in all policy and investment decisions at the local and national levels. 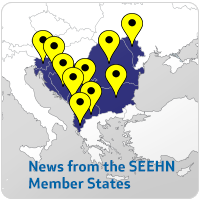 The Forum celebrated a decade of remarkable regional cooperation in public health in south-eastern Europe, which has resulted not only in productive and shared expertise but also 9 centres for regional health development, 10 pilot community mental health centres and a region-wide network of 60 institutions working on public health issues. The first and second health ministers’ forums, in 2001 and 2005, resulted in the Dubrovnik and Skopje pledges.